Today for #SundaySupper we had to make a recipe for Passover. So I thought what recipe screamed Passover? Then it hit me carrot cake! 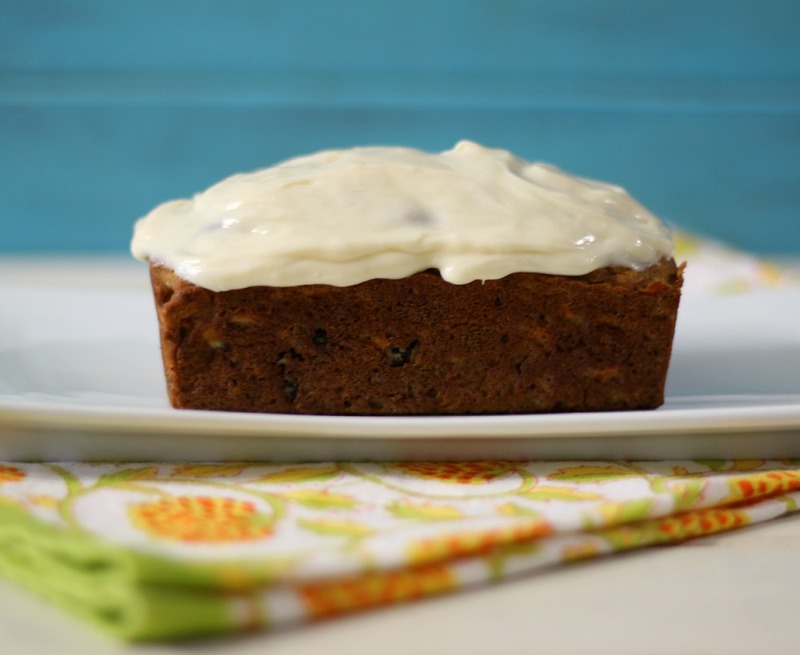 But not just carrot cake, how about Banana Carrot Cake Bread with Cream Cheese Frosting! Now that is what I am talking about!! This bread is just amazing!! It’s not heavy, it’s moist, full of freshly grated carrots, raisins, pecans and has the most subtle flavor of banana. It’s truly a remarkable bread!! But one thing this bread has that I love, love, love is the cream cheese frosting. Oh my gosh amazing! I swear I could just spoon the frosting. If love came in frosting form, this would be it!! This bread is perfect for Easter Brunch or to have anytime of the year. I don’t know why we have things like carrot cake only around Easter? But then again, maybe that is just me? Anyway, this bread also freezes nicely too, however I don’t recommend frosting it then freezing it. My Friends, Marlene and Billie at #SundaySupper gave me some great advice. I asked, how do I store bread that I frosted? Do you leave it at room temperature or do you refrigerate it? Refrigerate it was the answer! Just wrap it in aluminum foil and pop in the fridge. Poke the bread with toothpicks to keep the frosting from sticking to the foil. It worked like a charm. However, the bread does dry out just a tad bit when it’s refrigerated, but freshly eaten on the day you make, it’s drool worthy! 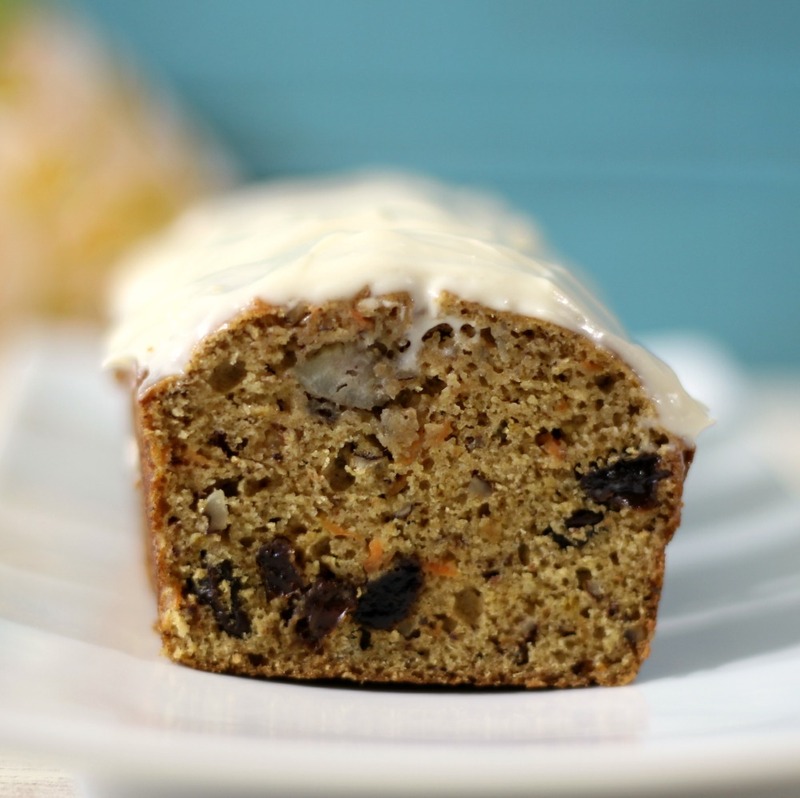 A moist banana bread, chock full of carrots, pecans, raisins and topped with a sweet cream cheese frosting. Spray a 9 x 5 loaf pan with cooking spray or 3 mini loaf pans; set aside. In a bowl, add flours, baking soda, baking powder, salt, cinnamon, cloves, and nutmeg; mix until well combined; set a side. In a large bowl, add banana, sugar and apple sauce; beat until combined. Beat in eggs. Stir in pecans, raisins and carrots; just until combined. Slowly stir in flour mixture, just until incorporated. Do not over mix. Pour batter into prepared pans and bake for 40 - 50 minutes for a large loaf or 25 - 30 minutes for mini loafs. Insert a toothpick into the center of the bread, if it comes out clean the bread is done. Let the bread cool for about 10 minutes in pan; then take out of the pan and let it cool completely on a cooling rack. To make cream cheese filling, in a mixing bowl beat cream cheese, butter, vanilla extract and confectioners sugar until light and fluffy. Spread over cooled bread. Now be sure to check out everyone’s recipes! I got a sneak peek and they sound amazing! I’ll be sitting here with a slice of Banana Carrot Cake Bread and a cup of coffee, enjoying my morning #SundaySupper! Ahhhh, thank you so much!! Happy Easter / Passover to you! 🙂 You made my morning. You knocked this one out of the ballpark! I wish this was my Easter breakfast…so tempting and a wonderful combination flavors! YUMMY!!! 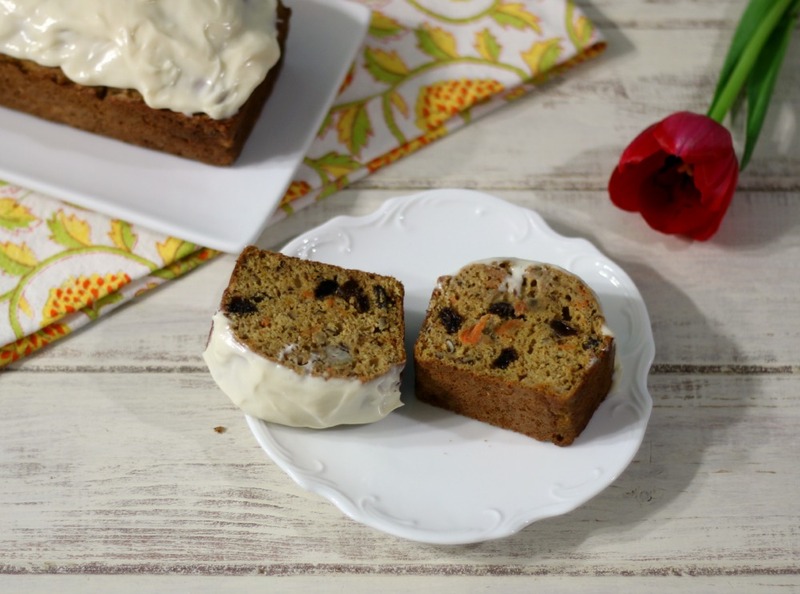 I love the idea of combining carrot cake with banana bread! Great idea!!! Happy Easter! Love this idea of combining 2 faves! This looks fantastic, yum!! Can I come over? Two of the best flavors mixed into one…great idea!!!! Perfect! I needed a recipe for all these ingredients right now! Perfect for Easter!! I love this Jennifer!! I’ll bet this is super moist and delicious! Great combo, Jennifer! I love the idea of a combining banana and carrot cake together! And yours looks fabulous! You seriously always teach me so much!! Thank you Jocelyn! That is a BIG compliment coming from you. Thank you! Banana carrot cake — my husband will die and go to heaven with I make this for him! Mmmmmmm…. Banana carrot cake bread . . perfect to nibble on on a Sunday!!! love this! Happy Easter! I love all the additions you put into this cake/bread! I also wouldn’t feel guilty having a slice with those nutritional numbers! Thanks Tammie! I try to make it as healthy as I can! 🙂 It’s a nice moist bread too! 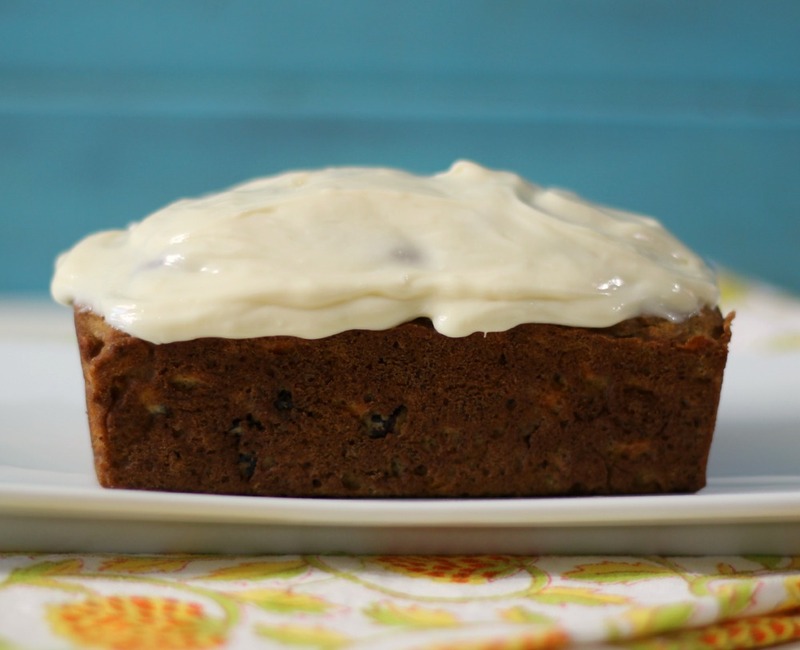 Your Banana Carrot Cake Bread looks so moist and I love the cream cheese frosting. YUM!! Thank you so much Betsy!! yes the frosting is amazing! I could eat it with a spoon. 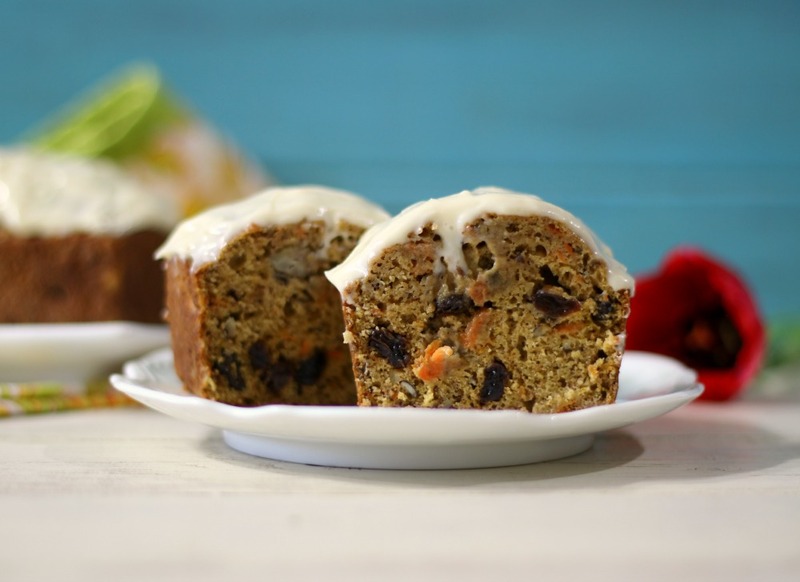 Banana and carrot cake bread sound like a great combo. The frosting is just an added bonus. 🙂 I have become a big can of carrot cake and carrot cake bread over the years and this is really tempting me to get up and bake. Yum! I was actually just thinking about carrot cake bread recently and wondering if I could find a recipe for one. Sure enough, here it is!